A simple, no-bake treat sweetened with maple syrup and full of flavor. The flavors are more prominent when the cups are at room temperature, but are still tasty right out of the fridge. Line a mini muffin tray with 20 liners. 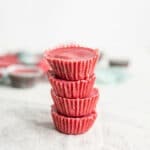 For Strawberry Coconut Butter Cups: In a food processor, add the shredded coconut and process until smooth, stopping occasionally to wipe down sides of bowl with spatula (about 3-5 minutes). ** Once the coconut becomes a smooth butter consistency, add melted coconut oil and vanilla extract and process once again until coconut oil and vanilla are combined. Add crushed freeze-dried strawberries and process until evenly incorporated. For Filling: In a medium bowl, combine almond butter, melted baking chocolate,* salt, maple syrup, and vanilla extract. To Assemble: Scoop one teaspoon of the coconut butter mixture into the bottom of each muffin cup. Gently shake the muffin tray to allow the mixture to settle evenly in cups. Scoop one teaspoon of the chocolate-almond filling and flatten into a disc with your fingers. Gently place on top of coconut butter mixture in cup. Repeat until all cups have filling. Finally, place another teaspoon of the remaining coconut butter mixture on top of filling, smoothing with the back of the teaspoon if necessary. Once complete, give the muffin tray a gentle shake once more. Place muffin tray in the freezer for 15-20 minutes to set. Remove from freezer and take cups out of muffin tray and place in an airtight container. Store in the fridge if not serving immediately. **If your unsweetened shredded coconut is not processing into butter as it should, add a bit of melted coconut oil a little at a time until the mixture starts to turn to a butter consistency. *To melt chocolate, place in a small microwave safe bowl and microwave for 30 seconds at a time, stirring between each interval until almost completely melted. Inspired by Edible Perspective's vanilla bean coconut butter cups with chocolate filling.